This December 10th, on internationally recognised Human Rights Day, Multicultural Fort McMurray will be holding a workshop for youth to celebrate, learn, and discuss issues affecting young people today. There will be a focus of developing the skills of a generation who will be able to lead the region into prosperity, peace and harmony. 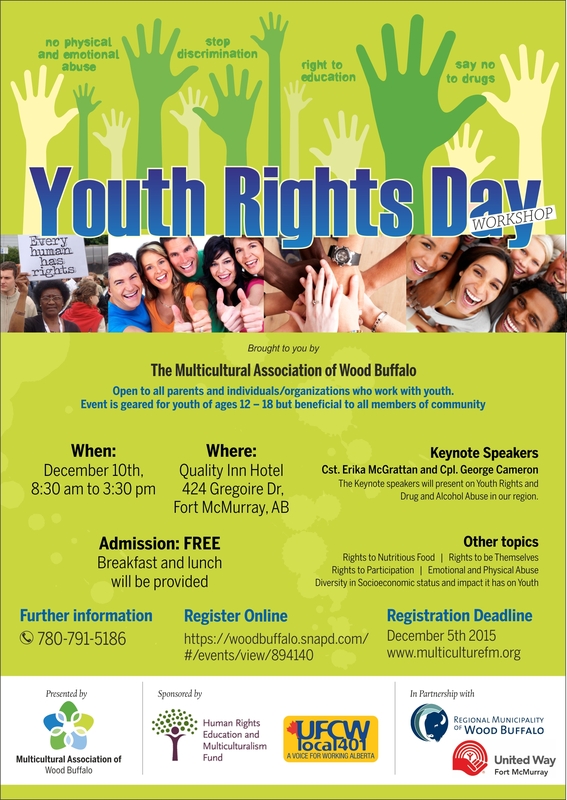 This is a great opportunity for racialized young people to discuss the issues they face while navigating life inside and outside Fort McMurray. UFCW Local 401 is honored to be supporting a great event and a phenomenal organization such as Multicultural Fort McMurray. This partnership will hopefully lead to UFCW Local 401 to become even more rooted in the vibrant community of Fort McMurray and area.